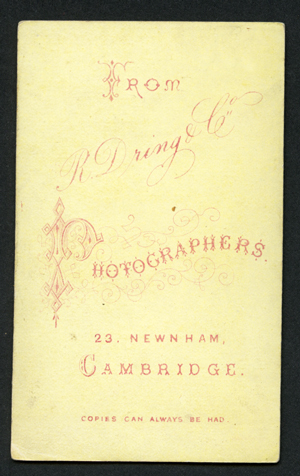 Subjects, styles, advertising, other relevant information: OB Drake was elected Lanternist for the Cambridge and District Photographic Society at their AGM, 10 Oct 1939. He gave a lantern lecture to the Society “With a Camera in Sussex” which was reported in the Cambridge Daily News p3 23 Nov 1939. His wife was proposed as a new member of the Society on 19 Oct 1937. The work of both husband and wife at the Society's annual exhibition was mentioned in the Cambridge Daily News 4 May 1939. Address: 4 Broad Street Cambridge (1891) 85A Norfolk Street, Cambridge (1896). Subjects, styles, advertising, other relevant information: William H Drake, b 1873 Highgate, London, was living at 4 Broad Street, Cambridge in 1891 with his uncle, William Drake, b:1834, Cambridgeshire, a builder, and his family. He was described as a "photographer's silver painter and re-toucher".In 1896 he was listed as a photographer in the local Kelly's Directory. In 1901 William had moved to Balaclava Road Bermondsey, London, where he lived with his wife Alice M Drake b: 1875 Cambridge and daughter Winifred M Drake b 1899 Walworth. He was listed there as a photographer (a worker rather than an employer). By 1911 William's occupation was described as "outdoor and commercial photographer, working on his own account from home at 63 Bassingham Road, Wandsworth. His growing family then included daughter Elsie b:1903 Bermondsey and son Herbert b:1910 Wandsworth. Subjects, styles, advertising, other relevant information: In the 1881 Census two young photographers were lodging at St Edwards Passage, Cambridge at the home of coffee tavern manager George Waller b: 1847 Woodbridge Suffolk and his wife and assistant Anna Waller b:1846 N.Devon. The two young men were Henry Drew b:1845 according to the census - but 1848 in reality at Camberwell Surrey and Charles Cheal b:1850, Crawley Sussex. Drew's photographic career was relatively short-lived - he had other occupations in 1871 and 1891, while Charles Cheal's photographic career spanned over 40 years. 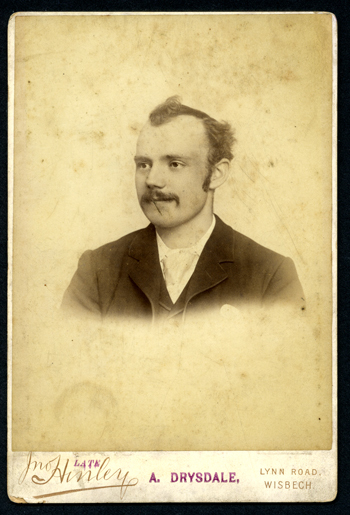 In 1871 Henry Drew, b:1848 Camberwell Surrey was living with his in-laws at 54 Albany Road Camberwell. His occupation was shown in the census return as retired clerk - clearly incorrect for a 23 year old. His in-laws were William Simmons, market gardener, b:1808 Berkshire and Esther Simmons B:1816 Gloucestershire. With Henry were his wife, Mary Ann Drew b:1851 Drury Lane Middlesex and their son Henri Colbert Drew b:1870 Camberwell Surrey. In 1881 Henry's family - his wife and son, were at 22 White Hart Street Westminster. His wife, recorded as "Mayanne E Drew" was a saleswoman. In 1891 Henry Drew was again a clerk, a mercantile clerk, lodging at 44 Arnott Road Camberwell, with a Viola Smith, her father and her son. We do not know at this stage what brought Drew and Cheal to Cambridge in 1881 or who they were working for. References: England Census 1871, 1881, 1891. The 1871 Census shows Robert and his wife Elizabeth b: 1845 Grantchester and daughters Agnes b: 1867 Cambridge and Maud b: 1870 Cambridge at 23 Newnham where he is listed as a shoemaker. The 1881 census shows the family (without Agnes) in the same location, Robert being described as a bootmaker. The 1891 census lists Robert Dring at 23 Newnham Cambridge as a bootmaker, living with his wife, daughter Maud and nephew Harry b: 1876 Cambridge. In 1901, at the same address he is described as a shoe maker. In 1911, listed at the same address, Robert is described as a shoe repairer, an employer operating from home. Photography must therefore have been something of a secondary occupation for Robert. In none of the census returns is he shown as a photographer and yet he is listed as such in the trade directories and some of his photographic work survives. 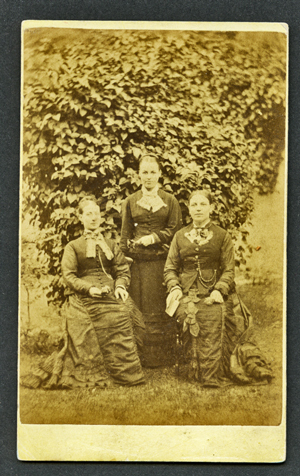 See below for an early carte de visite portrait of three ladies (author's collection) taken outside the studio. 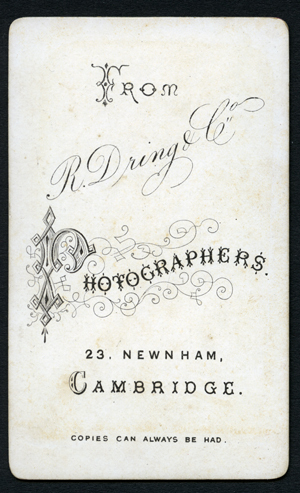 Mounted on cream board, square corners, with no writing on face, reverse printed in red ink "From R.Dring & Co Photographers 23 Newnham, Cambridge. Copies can always be had". Note the "& Co" designation which doesn't appear in the directory entries. 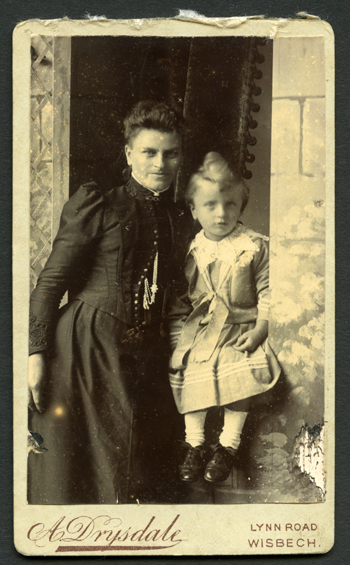 From the clothing and print style this carte appears to date from the 1880s. 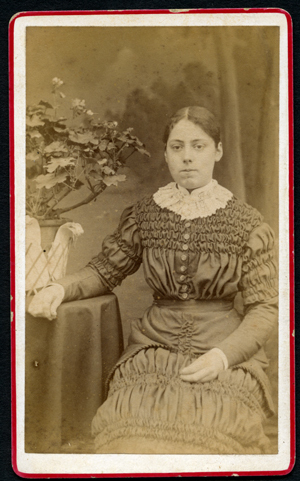 Beneath this is another carte, (author's collection) unknown woman c.1880s on a cream mount with red border with identical text. Subjects, styles, advertising, other relevant information: The only trace of this studio so far established in a photograph in the Norris Museum of local councillors dated 1972 with the legend "Dryden Photographs of 9 Dryden Close, St Ives"
Name: DRYSDALE, Alfred b:? d:? Subjects, styles, advertising, other relevant information: This Lynn Road studio was originally opened by Valentine Blanchard, was later operated by John Hinley, then Alfred Drysdale. 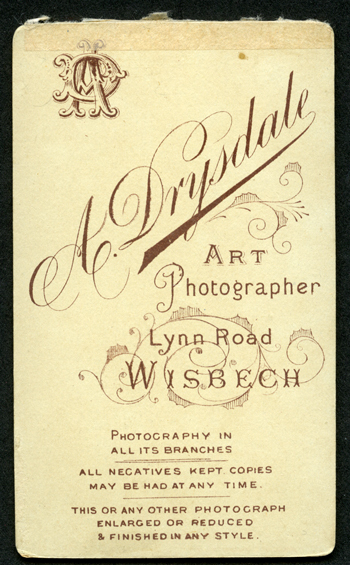 Lilian Ream started her photographic career as a young pupil of Alfred Drysdale. The studio was later taken over by Hardingham Mehew and Leonard Smith. Around 1909 Lilian Ream took over the Studio and Leonard Smith became the assistant. 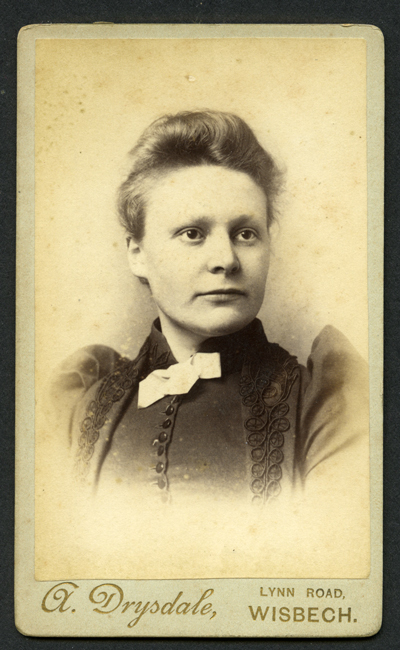 See below an early example of an Alfred Drysdale Cabinet photograph of an unknown man, where he has simply taken his predecessor's mount and overprinted in purple ink his own name on both the face and rear of the mount (author's collection).Below this an example of a carte de visite close up portrait of a lady by Alfred Drysdale. From the leg of mutton sleeves this dates from around 1895. 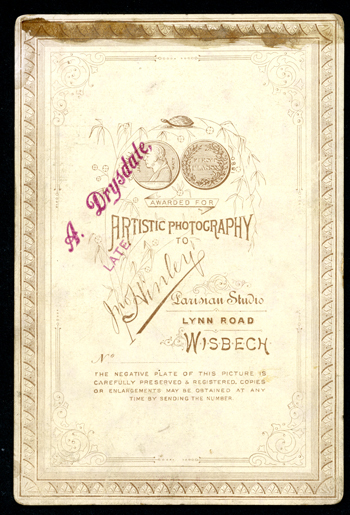 The reverse is blank, the front of the mount states "A Drysdale, Lynn Road, Wisbech". The mount is cream with gilt edging. Next is a portrait of mother and child from a similar period, with a more elaborate design of mount with gilt edging and the legend on the reverse "A Drysdale Art Photographer, Lynn Road Wisbech. Photography in all its branches. All negatives kept copies may be had at any time. This or any other photograph enlarged or reduced and finished in any style". The more elaborate mount suggests that this image postdated the one above it. No trace can be found in the census returns of an Alfred Drysdale in photography. There was however an Alexander Drysdale, a photographer, b:1867 Bolton Lancs in Wisbech in the 1891 census boarding at 4 Albion Terrace. Alexander had been a boarder at Spinkhill College Chesterfield in 1881. No trace can be found of Alexander in 1901, but in 1911 he was a widower and again a boarder at 9 Grant Street Jarrow where he was described as a "photographic manager" - a worker rather than an employer. Was the Alfred Drysdale here listed and shown on his work as A.Drysdale really Alexander Drysdale? Address: 1 Church Lane Whittlesford. 31 Hobson Street Cambridge (specialising in weddings) and 4 Milton Rd Cambridge 1987 (specialising in portraits). Photo lab at Whittlesford. Also studio in Haverhill. Subjects, styles, advertising, other relevant information: commercial, industrial, wedding colour specialists. In 1982 the firm expanded into the next premises in Hobson Street Cambridge. In 1987 the firm set up a training centre for photographers. By 1991 had a staff of 19. In 1997 Frances Dumbleton introduced a scheme called "Interphoto" supported by a national register of around 400 studios. A voucher could be purchased as a gift which could then be used for portraits by any of the registered studios. Staff included: Nigel Lazard (photographer and Director), David Brown (photographer), Terry Finding (manager of photo lab), Jaqui Gill, Andrew Martin (manager of Haverhill studio). A press report in 1994 stated that 5 of Dumbleton's staff had at different times set up break-away studios in the region. Subjects, styles, advertising, other relevant information: In the 1939 Register Auguste is shown as a photographer living at the above address with his wife Gladys E Dumont b: 1904. Photo historian Paul Godfrey has linked Auguste Dumont with a walking pictures firm operating in Llandudno called "Topical Pictures". Topical Pictures used converted cine camera to teke "walking photos" on the streets of Llandudno before WW2. Paul Godfrey discovered a report of a court case involving Auguste in the Liverpool Echo Monday 9th August 1937. Topical pictures also operated in Cambridge and Peterborough in the 1930s taking walking pictures. See our page on walking pictures for more information about Auguste Dumont and Topical Pictures. 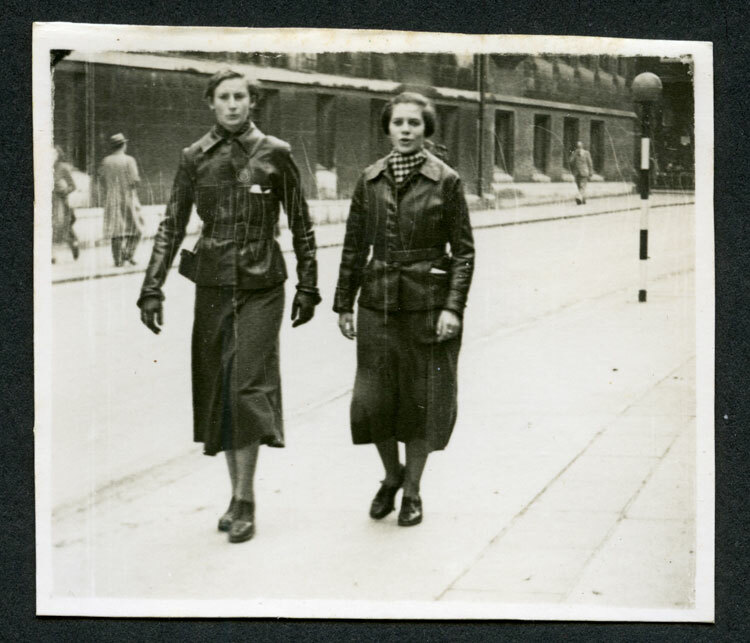 One example from Cambridge in 1936 is shown below. References: 1939 Register. Liverpool Echo Monday 9th August 1937.